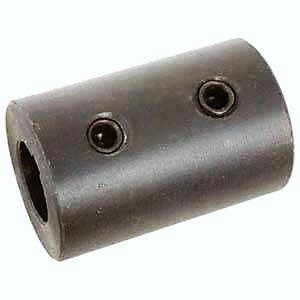 Set Screw Rigid Shaft Couplings Slide a coupling onto your shafts and tighten the two set screws, for locking on to the shafts for a tight hold. When used with a key on a keyed shaft, couplings with keyway provide a more secure hold. They have standard ANSI inch dimensions. The Black-oxide steel finish offers some corrosion resistance. Contact us if you need a little help from your friends at Rainbow.